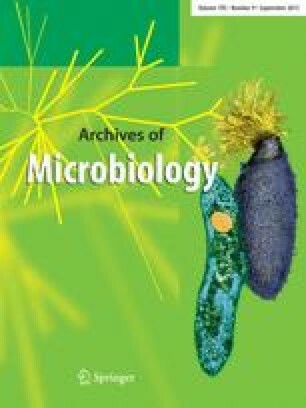 Description of “Spirillum” 5175 as Sulfurospirillum deleyianum gen. nov., spec. nov.
Physiological tests, redetermination of G+C values with HPLC and DNA-DNA hybridization were used to determine the taxonomic affiliation of “Spirillum” 5175. This facultatively sulfur-reducing bacterium was compared to the type strains of the phenotypically most similar species Wolinella succinogenes and Campylobacter sputorum biovar bubulus. In addition to morphology, the following physiological properties were in common: use of elemental sulfur, nitrate, nitrite, aspartate, fumarate or malate as electron acceptor for growth with hydrogen or formate under anoxic conditions; microaerobic growth with 2% (v/v) oxygen. The G+C content of Wolinella succinogenes (51.8 mol%) and Campylobacter sputorum biovar bubulus (30.4 mol%) differs about 10 mol% from the G+C content of “Spirillum” 5175 (40.6 mol%). No significant DNA homology could be detected between the three strains. These differences excluded affiliation of “Spirillum” 5175 with the genera Wolinella or Campylobacter despite phenotypic similarities. On the basis of our results and DNA-rRNA hybridization studies by other authors, we established the new genus Sulfurospirillum for the freeliving Campylobacter-like bacteria “Spirillum” 5175 and “Campylobacter spec.” DSM 806. Strain “Spirillum” 5175 is described as the type strain of the new genus and species Sulfurospirillum deleyianum.